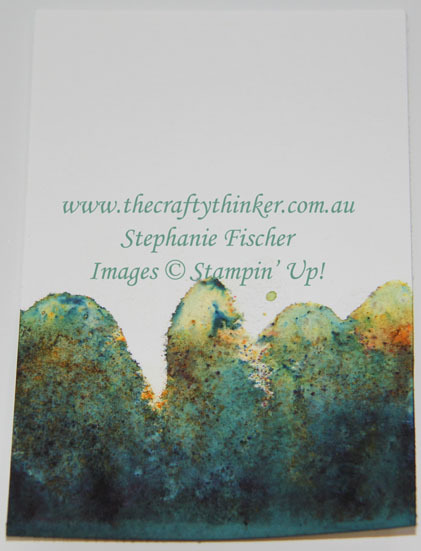 This card is entered into the Crazy Crafters Project Highlights this week. Click here to see the fully array and vote for your favourites. The other day, in the post Christmas quiet, I got out the Brusho Colour Crystals again. I knew I wanted to create a tree line and thought I'd make it easier for myself by using the Lovely As A Tree stamp to guide my water application. 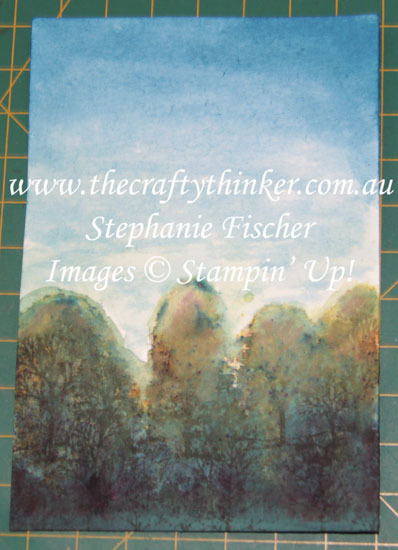 So I stamped it in Pear Pizzazz onto the watercolour paper. I then liberally applied water (with a mop brush) to the area of the trees and ground and sprinkled on Brusho crystals, starting with yellow towards the top, then green and then blue and overlapping a little. As you can see - I used plenty of crystals to get a dense colour coverage. I just left it like this to dry. Once dry, I tapped the back of the paper to remove the loose crystals. The remnants on my work surface didn't go to waste! I spritzed on more water and grabbed some leftover bits of Whisper White cardstock to press into it. I'll show you what I did with those at a later date! So this is what it looked like once it had dried. 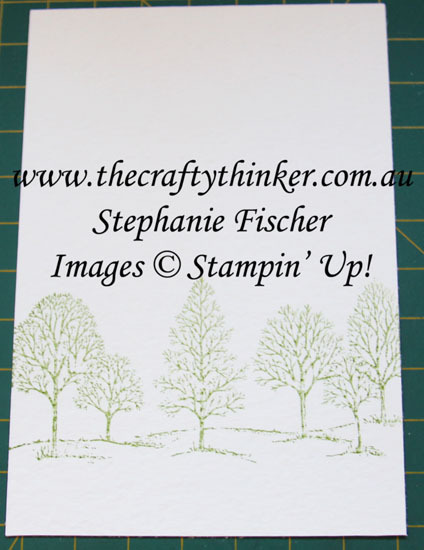 I decided to use the Lovely As a Tree stamp again to add a bit of definition to my wooded area. I stamped with Early Espresso several times and then didn't like what I'd done! So I got out a damp brush and softened the stamping a little. I still didn't love it but it was an improvement! I then put a tiny amount of the blue crystals in a container and added quite a lot water. 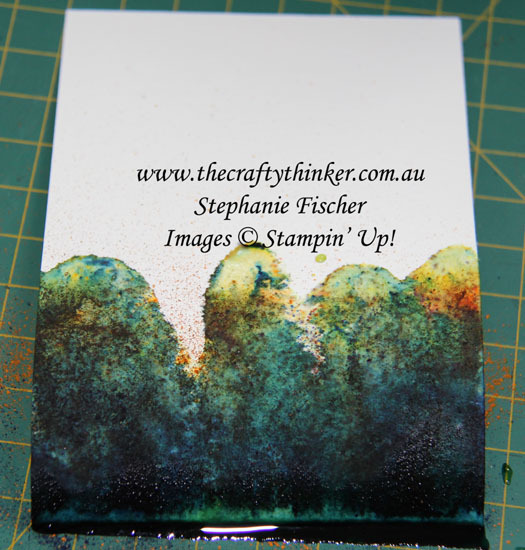 I used this and a wet brush to paint the sky, using more pigment at the top of the card. 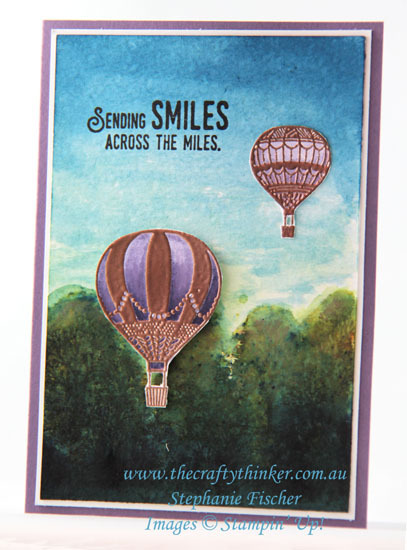 Then I copper heat embossed the balloons from the Lift Me Up stamp set, watercoloured them with Elegant Eggplant ink and cut them out. Initially, I used the matching dies but I didn't want the white outline around the balloons so I ended up fussy cutting them. The larger balloon is adhered with dimensionals. The base card is Perfect Plum, followed by a layer of Whisper White.